Dynamically-updated previews are wonderful. But because the preview appears below the post, I can only see the top of it. If I'm adding to the bottom of a long post, the browser is working and working to update the preview, but I can't actually see the relevant part of the preview, because it is off the bottom of the screen! Possible solutions would include scroll bars on the preview area, preview side-by-side with editing area instead of underneath it, or some sort of windowing effect where the preview area would show only the part of the preview around the part of the post that was most recently edited. As you can see, only the top of the preview window is visible. Let me know if it fails to work for you. For completeness, the code is below. I've run into the same problem while posting answers with tall screenshots. I think there is a relatively easy solution available: adopt the same side-by-side fluid preview layout that Discourse uses. Discourse is forum software created by Jeff Atwood and others after he left StackOverflow. Here's the feature request posted on meta.SE to enable side-by-side Mardkwown preview. Are there any other recourses available to this question? I tried user79365's bookmarklet using Windows 7 and Firefox 27.0. The result is the following. There is a preview on the RHS, but the input box ceases to function. To wit, after I click on the bookmarklet for that same window, I can't type anything in the input box. Addendum: This doesn't work; I am leaving it here for reference. Why not: Tile Tabs can't tile a tab with itself. What it does it open a new tab to the same URL, and tile the old and new tabs together. But then editing in one tab doesn't affect the preview in the other tab. I have finally found a good solution to this problem. Here the edit area is in the left viewport, and the display area is in the right viewport. There is plenty of room in both. 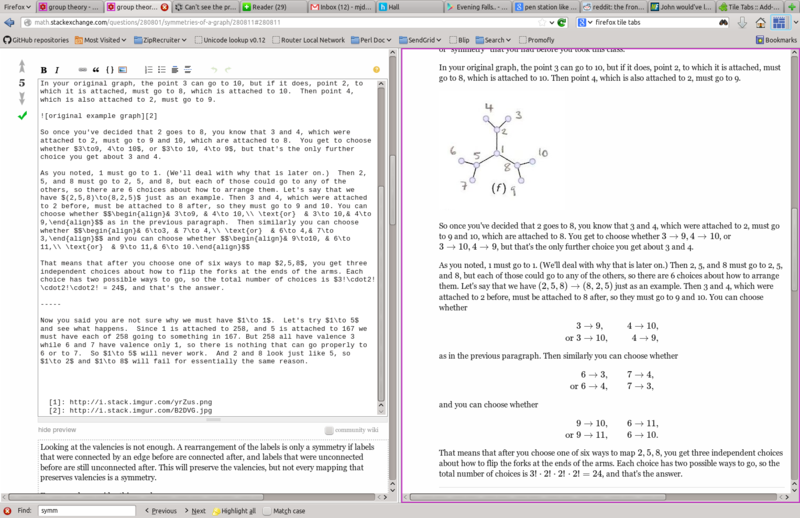 The screenshot is of a browser window that does not even take up the full width of my laptop screen. Not the answer you're looking for? 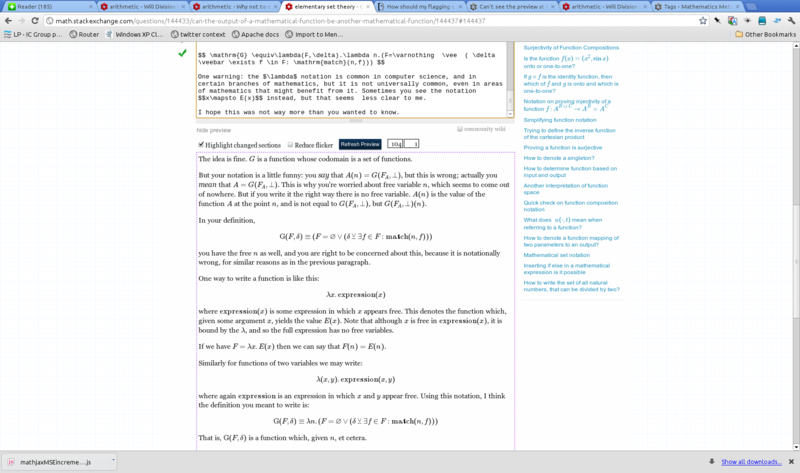 Browse other questions tagged feature-request mathjax design user-interface layout .